Leighton Buzzard were well beaten once again, this time by high-flying Kettering as their torrid season continued with a 48-0 defeat. It is now six defeats from eight in Midlands 1 East as Buzzards sit 12th of 14, but their ambitious and at times adventurous rugby worked against them as Kettering took every advantage they could to romp away, including a change in direction of the wind to benefit the home side. Buzzards kicked off but the wind took the ball directly into touch, handing an early initiative to the home side. From the resulting scrum, Kettering worked through numerous driving phases eventually touching down after two minutes, which with the conversion gave them a 7-0 lead. Leighton were struggling to gain possession but were defending resolutely when three bad pieces of luck came in quick succession. Firstly after ten minutes Buzzards secured a turn-over of possession at a maul, only for the referee to inexplicably award a penalty, apparently for hands in the ruck, which Kettering gratefully kicked to go 10-0 clear. A minute later James Ward pulled his hamstring and had to be replaced by debutant James Brett and thirdly Arran Perry was shown a yellow card for trying to free his teammate who was being held illegally on the ground. The Kettering lead was extended by a converted try to 17-0 after 19 minutes when a quick tap penalty caught Leighton napping. However Buzzards were now gaining more possession and had their best attacking moment of the half after twenty-five minutes when a 50 metre break by Arran Perry was stopped in the home team’s twenty-two. 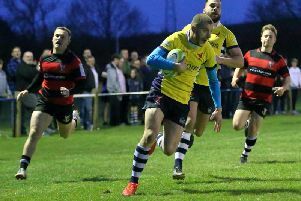 After half-an–hour, Kettering extended their lead with a fine try attacking down the right wing before recycling and stretching the Buzzard defence to score in the left corner. This took their lead to 22-0, which remained the score at half time. Whilst the strong wind was mostly across the field it had definitely been in Kettering’s favour during the first half, the direction had now altered to remain in the home side’s favour. This was to restrict Buzzards’ opportunity to release pressure with long kicks. Despite this, Leighton were much more competitive and the first 20 minutes of the second half were pointless. In fact, it took a Buzzard mistake to break their defence - a long pass was intercepted for a clear run to the posts – surprisingly the easy conversion was missed but Buzzards trailed 27 -0. Indecision in dealing with a high kick and a fortunate bounce gave Kettering their next try to lead 34-0, with ten minutes left. Kettering counter-attacked to score a fine try in the left -hand corner. There remained time for a similar counter-attack, again following loss of possession in contact to give Kettering their seventh try and a 48-0 final score. Leighton slip to 12th in the league and next week welcome Wellingborough to Wright’s Meadow.